Whilst we often think of tea as a hot beverage, there really are an incredible array of alternative ways that you can enjoy it. Whether you’re simply brewing a pot of Dr Jackson’s Tea, or injecting some flavour into your cooking – you can’t go wrong. Our favourite chef, Peter Gordon, talks us through some great ways to shake simple recipes up with - you guessed it - tea! Peter Gordon is renowned for his unique culinary philosophy and playful fusion cuisine which has had great influence on his distinguished restaurants and books. In what surprising ways can tea be used? It’s easy to begin experimenting with treating tea as a flavouring like you would a dried herb. For example, mint is lovely brewed as a tea with a touch of honey, but it is of course, also delicious in salads, tossed with feta and chunks of watermelon, or mixed with labneh (strained yoghurt). That doesn’t mean you should rip open your teabags and dress your food, but you can definitely use tea in many different ways. Tea can be used as a flavouring in marinades, broths and soups, in dressings, for poaching fruits and even for chocolate truffles. What’s your favourite recipe that includes tea? 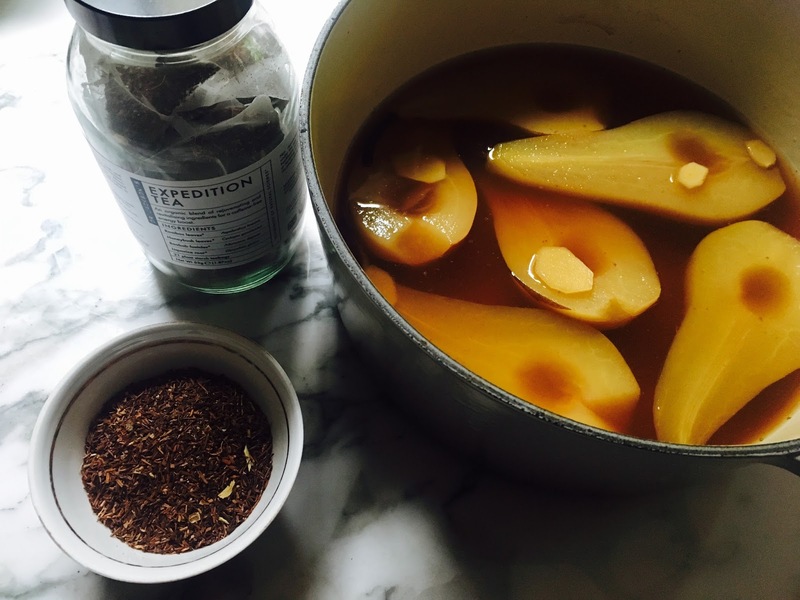 I love to add an Expedition teabag to a lightly sweet syrup when I’m poaching pears or steeping berries as the rooibos has a lovely ‘tang’ that perfectly complements the fruit. I’ve also added a few teabags in a chicken and coconut soup as the liquorice in the blend has a lovely, warming character that goes wonderfully with coconut milk. What’s your simplest recipe using Dr Jackson’s teas? This is so simple, it hardly seems a recipe at all! I drink an awful lot of tea and make mine in a teapot with 2 teabags usually. Inevitably, I have some left over, so I’ve begun freezing the remains in my ice cube tray. Once frozen, I pack them in separate freezer bags according to the various flavours. I’ve found that the Expedition tea-cubes and Relax tea-cubes are delicious in a vodka tonic - or in a mixture of chilled apple and elderflower juice. The Detox tea-cubes are great mixed into fresh juice (especially one that contains beetroot), or in a big jug of iced tea or sangria. Most herbal teas consist of leaves, roots, rinds and seeds which are the part of the plant that contain the highest concentration of phytonutrients, antioxidants and other phytochemicals that provide medicinal benefits. Poached pears are lovely thinly sliced and mixed into leafy salads with crumbled blue cheese or feta, toasted pumpkin seeds, a good splash of extra virgin olive oil and a squeeze of lemon juice. Cut them into chunks and add to porridge or a chia breakfast bowl, or serve them as dessert with a dollop of vanilla yoghurt. You can also add a handful or blueberries or blackberries to the poaching liquid in its last 5 minutes of cooking to add a lovely hue to the pears. Once the pears are eaten, you can use their poaching liquor to cook one more batch of fruit, or use the liquid in smoothies or freeze in ice-cube trays for use in other drinks. You will need: 3-4 pears, 2 Dr Jackson Expedition tea bags with paper tags removed and strings still attached (or use loose tea and strain the liquid before adding to the pears), 150g honey (or agave syrup), 20g fresh ginger, peeled and thinly sliced. Place the tea bags, honey and ginger to a wide pan large enough to hold the pears and add 1 litre of water. Slowly bring to a simmer. Simmer with a lid on for 8 minutes. Peel the pears. Cut them in half lengthways, remove the seeds and core (use a small teaspoon) and add the pear halves to the liquid. The pears need to be just submerged in the liquid – add extra water if needed. Bring back to a boil, then reduce to a simmer. Lay a paper cartouche (*) on top of the pears, put a lid on and cook for 30 minutes. Turn the heat off and leave the pears to cool in the liquid – although you can eat them hot. Store the pears in their liquid in the fridge, covered, for up to 5 days. * A cartouche is a piece of baking parchment cut a little larger than the size of the lid of the pot. Lay the lid on top of a piece of baking parchment and mark it with a blunt pencil or satay stick – you don’t want to eat pencil lead. Use scissors to cut it out 1cm wider than you’ve marked. Fold it in half and then half again. Cut the point of the paper out, 1/2cm in, and unfold. You will now have a round piece of paper with a small hole in the middle. This is a cartouche. This is the perfect bed-time drink. 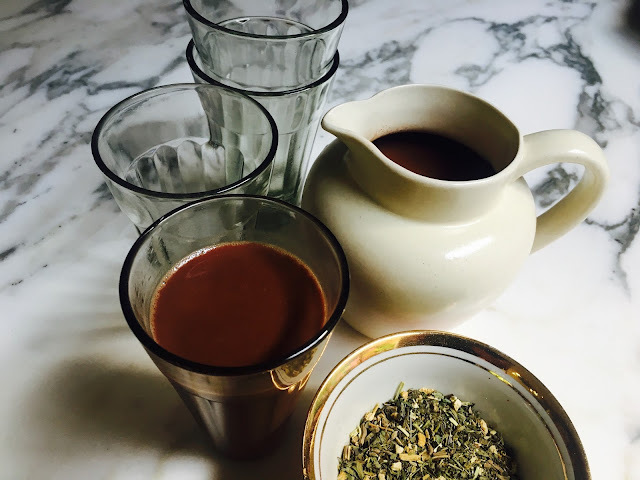 A lovely mixture of dark chocolate, cinnamon, orange zest and oat milk, infused with the calming herbs of Dr Jackson’s Relax Tea – with its lemon balm and valerian. For this, I like to use a darker chocolate of between 60 – 90% cacao solids. You can also make this using soy milk or regular milk. I like to serve a small glass to my dinner guests in winter, just before they head home – and I must say, adding a slug of whiskey or dark rum isn’t bad either! For 2 mugs (or 4-6 smaller ones), you will need: 2 Dr Jackson’s Relax teabags or use 4 teaspoons of loose tea, 400mL oat milk, ¼ teaspoon of ground cinnamon, 50g dark chocolate chopped (65%-80% cacao solids), ½ teaspoon of orange zest – finely grated. Place the Relax Tea, oat milk and cinnamon in a small saucepan. Add 100ml of water then slowly bring to a simmer, stirring occasionally. Increase the heat a little, but don’t boil it. Add the chocolate and orange zest and stir until the chocolate has melted into the milk. Strain into 2 warmed mugs – then head to bed.